Looking back to the first iterations of travel Web sites, we can appreciate just how far technology has come. As advancements like high-speed connections began to replace the now archaic dial-up experience, consumers adjusted their expectations and demands of the companies they patronized. 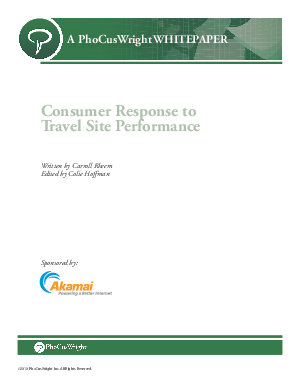 To gain a deeper understanding of the status of travelers' current online expectations, Akamai commissioned PhoCusWright to conduct a study examining key elements of the online consumer experience. This paper will examine five aspects of online travel-satisfaction levels, speed expectations and tolerance, activities during page loading, reasons for abandonment and reactions to technical issues.